I know from experience what it’s like to feel so desperate when your old dog won’t eat, you’re willing to do and try anything! Red, the love of my life, sadly got her wings on May 18 of this year (2018). I adopted her when she was around 8 so we think she passed at around 17 years of age. She was obese when we adopted her, bless her, so trying to get her to eat was never a problem. I always said she was like a vacuum cleaner because there wasn’t anything she wouldn’t inhale. When I say inhale I mean that literally, which is why she could never eat dry food because she wouldn’t chew just swallow. The last few months of her life getting her to eat became a real challenge. I believe having been on various medications for so long played a part in her developing a fragile system, then kidney issues and chronic pancreatitis made it even more difficult. Those two health challenges significantly shortened the list of what she was allowed to eat, so when she wasn’t feeling well I was always a nervous wreck because I didn’t have a lot of tools in my tool box to work with. What made it even more difficult was – some of the foods that are okay for kidney issues are not okay for pancreatitis and vice versa. When the only thing she would eat was chicken I had to give it to her, knowing full well it wouldn’t have been good for her kidneys. What could I do, she was basically screwed either way, so my vet and I decided at that point it was just important she ate. Why isn’t your dog eating? I read a lot about people who have dogs that won’t eat and they’re constantly looking for things to try… as they should be doing. However, the first thing you have to do is figure out why your dog isn’t eating, or eating as well as he or she used to. If you don’t yet know the reason, the best advice I can offer is to see your vet. My second best piece of advice is to NOT accept a diagnosis of “your dog is old.” Old age does not mean your dog stops eating. Perhaps it has made him a bit fussier, or his meals are too big to eat all at once and you should feed him 3, 4 or even 5 small meals a day, but not wanting to eat? I don’t buy it. There are lots of reasons why your dog may be less interested in eating and I’ve already mentioned the two Red was dealing with – pancreatitis and kidney disease, both of which can cause nausea. A third thing that came into play was dementia, which made it hard for her to find or know what to do with her food, even though her face was in the bowl. Sometimes as hungry as they may be, they just can’t seem to eat. I have a diagnosis now what? Of course that will depend on the diagnosis and whether or not there is a treatment to cure or manage the condition. Perhaps your dog will still be fussy and not as interested, what then? That’s a given because let’s be frank, bad things happen when your dog is starving. A few years ago I started elevating her bowls which I found was more comfortable for her. You could buy raised feeders or get creative on your own. Red was very little so putting her water bowl on an overturned casserole dish on the floor gave her enough height, but not too much so she had to reach. I held her food bowl for her, again because the height was more convenient. I discovered warming up her food in the microwave for a few seconds helped a lot, it seems the smells made it more appetizing. There were many times in the last few months where I had to hand feed her, more because of the dementia. Heartbreaking to watch so if your dog is suffering from dementia I urge you to put her on a treatment plan. 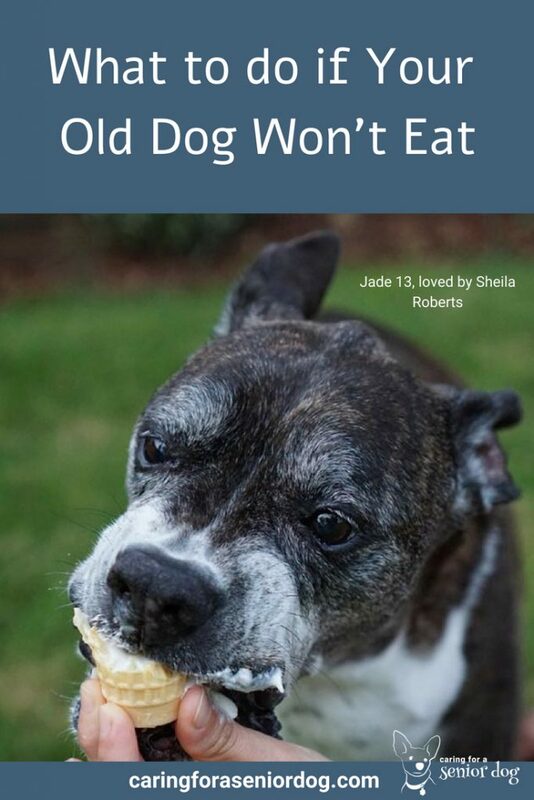 I did write about this topic in a previous article called “How to Get an Old Dog to Eat” , and in that post is a very lengthy list of possible food choices. 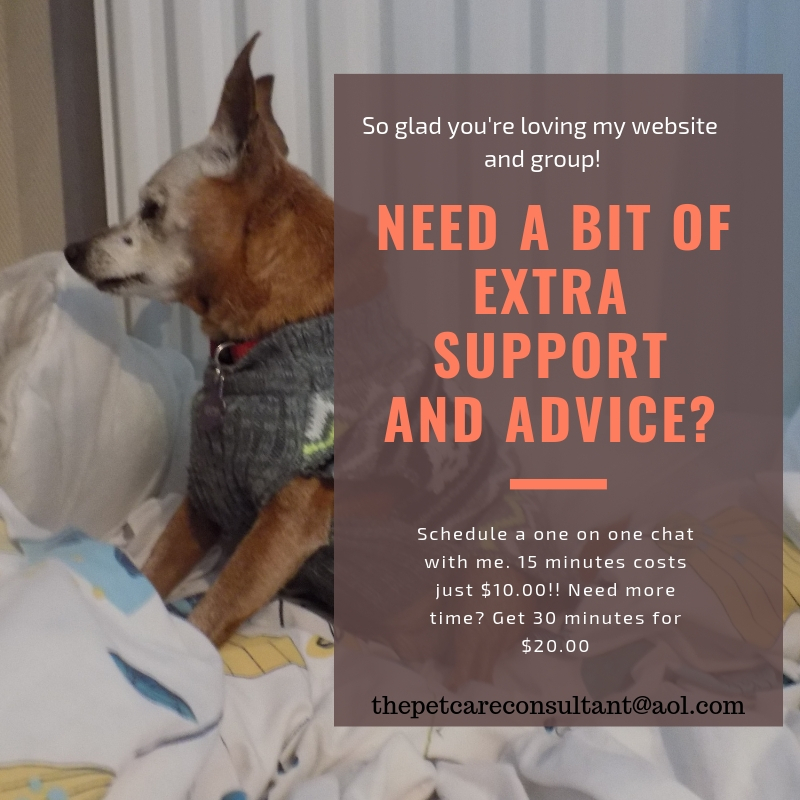 Since it was published I have started a FB group called Senior Dog Care Club, filled with incredible members who have some fabulous advice. They very kindly offered to share their tips and tricks for when their old dog won’t eat, and now I’m sharing them with you. The more things we have to try, the better we can care for our senior pups. Be sure to check with your vet before adding something you aren’t sure of, because what one dog is allowed the other may not be. For example, Red wasn’t allowed coconut oil because of her pancreatitis, or peanut butter because the salt content wasn’t good for her heart. Bacon grease, bone broth, canned liver mixed with dry food, meat scraps. I take frozen veggies, mine likes carrots. Cook them then purée it in a blender. Use a little water to thin it out. I put about two tablespoons on her food daily. Diced ham and rice, warmed up in the microwave… added to their food in small amounts. I admit – this can be a struggle! Depending on the type of food, warming it up can help. Sometimes I need to hand-feed. Other times, as I am hand-feeding, I will gently push the food towards their mouth and let it brush against their lips. That will cause them to lick their lips and usually/eventually interest them in eating. Other times, if it is food that is in a plate or bowl, I will add a few tiny pieces of a favorite human food to their meal. Right now a few tiny crumbs/pieces of pizza crust does the trick. Sometimes, they might just eat the crust from their bowl, but 90% of the time, they end up eating everything (both their food and the pizza crust). I’ve had success with chicken, hamburger and ground turkey. Canned cat food; something smelly. Sometimes I had to pull out the big guns: steak. Warming it up helps. One thing she has never turned down is a baked potato with butter. When desperate carbs can be a great friend. I have found rolling her food in my hands and giving her a bit at a time helps. She likes when I drop it in piles on the floor for her. Sometimes she prefers to stand and eat from the bowl. I have to gauge her mood a bit. Definitely try rolling the kibble in your hands though. It can really help. Boiled chicken tenderloins and cut it up, add some noodles, water or bone broth, add a bit of dry dog food, mix well serve warm and moist. You could try lean ground beef. My Lily eat this every day. If she’s having tummy issues I just give her the chicken with the noodles sometimes I’ll add peas and carrots and always moisten and warm food. Feeding them some of their food in the park. A change of scenery might help. Unflavored and unsweetened yogurt. Cottage cheese sometimes. Plate instead of regular dog dish sometimes helps. Mozzarella. Unseasoned smoked meat and broth made from the bones. Strong scent can make a difference. Cook or pretend to cook food that goes in a meal. Pretend to eat what you want them to eat. Allow them to not eat some meals. Try a different schedule. Walk before meal and allow them to fully wake before trying to feed. Sprinkle a little of a fav treat (like turkey) on top of and throughout the food. Diversify. Rotate the type of meals each day. Organic ground turkey that I mix with an organic golden paste recipe and mixed organic veggies cooked and put in blender (broccoli cauliflower and carrots). She has been scarfing it down and has picked up in energy! I’ll add mashed up sweet potatoes, pumpkin and broccoli. Our Eskies love their broccoli. They’ll eat it soft, and also like to eat the stalk cold like a bone! 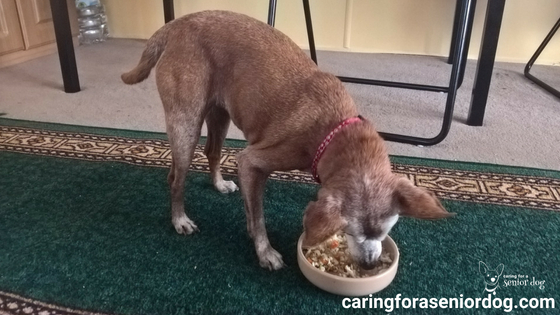 So there you have it…lot’s of things that have helped other senior dog parents when their old dog won’t eat. What have you tried that worked? Sharing helps others so please leave your comment below. Check out my Facebook page, Caring For a Senior Dog for stories, quotes and interesting articles about senior dogs. All good advice. Fortunately, my old guy (about 13) is a picky eater but still eats. Cheese solves everything. However, pancreatitis is a concern so I am watching fat content carefully. Freeze dried toppers are often high in fat. I’m looking for 10% or less fat content. Cheese does solve everything in this house as well, and I know what you mean about fat content and pancreatitis. Red had the same issues. I found cod was a good one to hide pills in, and my vet was okay with me giving her low fat (although I bought no fat) cottage cheese. When I was really desperate I would get low fat hard cheese and give her the tiniest piece I could. She loved when I baked her canned kidney food so it was easy to slip a pill in there as well. I clearly remember what it was like trying to get my senior dog to eat – I was desperate and tried a variety of foods. Eventually, just like you said, it gets to the point of you just need to get them to eat. I made her food, and found warming it helped and encouraged her to eat. Warming does help a lot, and I find it oddly comforting knowing there are so many going through the same challenges and sharing tips to help. Thanks for this. My dog is almost 12 – and technically a senior – and recently she’s not been finishing her food bowl in the morning. I’m not sure exactly why – is she just getting distracted, or is there something more? She has no problems when she does eat, and she enjoys her treat when I have her go into her cage in the morning. She still begs for food when I eat. Right now, I’m keeping a close eye on her and will be weighing her soon to see if there’s been any significant loss in weight. She doesn’t look any skinnier, though. Perhaps you would like to join my FB group Senior Dog Care Club. It’s a wonderful supportive community, and lots of great help and advice. I hope Layla is feeling okay, great to hear she’s loving her chicken. I used to raise Red’s water and food bowls and I found it made it more comfortable for her. That’s a great idea to take her food to the park rather than treats, let me know how that works. A chance of scenery may be the answer. Great post! My oldest boy will be 10 in December but luckily getting him to eat has never been an issue for us. Quite the opposite, he likes to eat a little too much so we had to put him on a diet. I’ve always jokingly said that the only thing that’s ever going to stop him from eating is going to be death. He’s such a foodie! It’s so much easier when they love their food, the worst is when they stop eating and lose weight and they’ve lost interest. Glad to hear your pup is loving his food. These are great suggestions! When my sister’s dog stopped eating, I heated up a freshly made dog food (NomNomNow) and she would eat that along with her favorite brand of dog treats. Eventually, the vet removed her spleen and she made a good recovery. 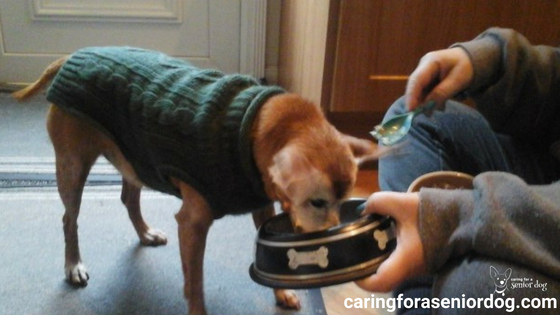 Warming up food is a great way to entice a dog to eat. I’ve had good success with an old old cat making a gruel he could drink out of kitten formula or goat’s milk and honest kitchen cat food and baby food, and serving in an elevated saucer. Great tips thanks for sharing. It’s funny you say Temptations are like kitty crack. My cats were never big on treats, more accurately they had no interest until we got a sample of Temptations and they loved them! I have one dog who is approaching or I guess technically in his senior years (turning 9 next month)-this is good info to have even though for now he’s a really good eater. Thanks for all of the great info. It’s always good to have resources available, ready when you need them. It’s horrible when your pet won’t eat. I watched my friend go through that experience with three of her senior cats and it was heart wrenching. These are great tips. And Hindy is right… Temptations are like kitty crack! It really is tough when they won’t eat, and they really need their medication. 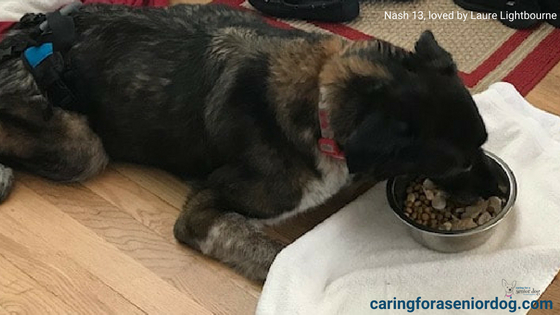 Food things can get pretty complicated when it comes to older dogs or dogs who are plagued with ailments. Jasmine gave us quite a challenge getting her to eat as well. First because of her IBD, later on, because of liver issues. In the end, she was unable to eat at all. 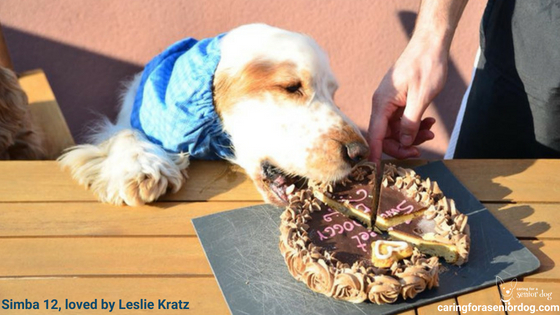 It gets even harder when the things a dog would likely enjoy are forbidden because of underlying health issues. Finding a way of making it smell strongly and attractive often helps. It can be quite complicated, and it’s true how much harder it is when the foods they loved are on the NO list. I used to microwave Red’s food and it helped at times. Again, a great post, Hindy. Wonderful sharing of tips. I have one Husky who is not a big eater and always causes me concern, especially since he is 10.5. He has always been this way due to anxiety issues that cause GI upset, but I have him on a regimen to help ease it and encourage him to eat – I started him on CBD treats an hour to hour and a half before he eats, he is also on Pepcid. I make boiled beef and chicken and turkey, salmon, I add pumpkin, baked sweet potatoes, coconut oil, Omega-3 oil, organic blueberries, salt-free cottage cheese, organic cream cheese, organic creamy peanut or almond butter, and fat-free Greek yogurt. If he is really on a food strike, I will sneak in tiny bits of gluten-free pizza crust sprinkled on top and also crushed treats and shredded cheese. My goal is to at least get him to eat! My other Husky, she will eat anything and everything that is not nailed down! So if she does not eat, I know something is up! Thanks again Dorothy. Sounds like you have a great schedule, and the CBD treat idea is a great one. I agree, sometimes it’s more important that they eat than what they eat. Red was like your Husky who would eat anything, I always referred to her as a vacuum cleaner. Like you, when she didn’t eat I knew there was a problem. I’m SOOOO happy one of your 1st recommendations was having your dog examined by a vet. Anorexia AKA inappetence or not eating) is a clinical sign of so many health issues. It’s so important to get a proper diagnosis so you know how to proceed! Thanks Bernard!! I’m always banging on about people going to see a vet first thing whenever there is a change in behaviour, particularly in a senior dog. Without knowing what’s wrong with your dog, how could you possibly know the best course of action to take! Isabelle and Cookie kept eating until they passed at 13.5 and 17.5 although Isabelle became quite picky and ate less more often and more wet food. Nala the cat was so healthy but then got kidney disease at 19 and I had to get a special diet and hand feed her regularly as she lost interest in most foods. She loved chicken and tuna so I made the same decision – let her enjoy her last 6 months where possible and let her have pieces from my fingers. At some point it’s more important that our animals eat something, rather than worrying if it’s the “right” thing. I know I was faced with that decision and I chose to make sure Red ate, even though I knew it wouldn’t be the best thing for her. She had lost weight and that wasn’t a good situation either. Great advice. When Keria was so ill I brought to the hospital a hamburger (or two) and she ate that. Thank God. She was refusing everything else. Sometime you gotta do what you gotta do! Glad you found something that worked, I know how stressful it can be when they refuse everything you try. I agree, sometimes you have to give them food you wouldn’t ordinarily try just to get them to eat something. Hi Hindy. Just joined your FB group just now. Hope to be included soon to get some tips and guidance. I have a 12 y/o shih tzu who has started being so finicky and would eat sparingly every day-if he even eats at all. We’ve been to the vet for a different issue-his liver enzyme count has been high lately and so he’s on a holistic treatment to bring it down and so far so good. His liver count came down. However he’s still not that interested in food. he’s been on raw food for years and have had no problem but lately all the treats and main food he used to love are not a big hit for him. So I had to change the whole diet and what he eats one minute, he’ll turn his nose away from it the next. So frustrating. Sometimes even heating it up doesn’t work. So it’s definitely a challenge and a hit and miss for the both of us everyday. I’m encouraged from reading stories here, that I can give him food that may not be that healthy just to get him to eat. I will definitely keep that in mind. Very common for old dogs to get finicky. Their senses may become dulled, be nauseous from kidney issues for example or even because of the onset of dementia. There is an article on this site about getting an old dog to eat, plus it’s a very common topic in the group. Hope you get the support and information you’re looking for there.